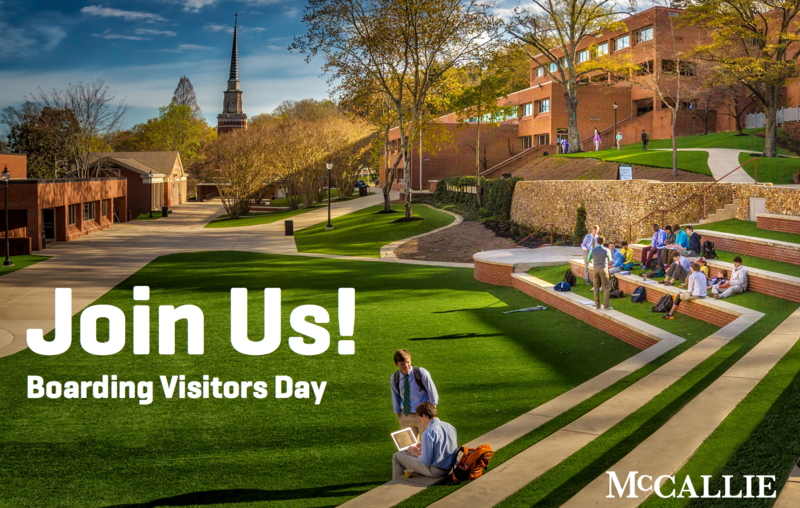 Boarding Visitors Day is the best way to get a closer look at what makes McCallie special. Our visit days are a full-day opportunity to see life on the Ridge. You’ll have the opportunity to hear from members of community from every walk of life, from current students and parents to teachers and administrators. Parents and students have separate schedules to let them focus on what’s most important to them. A highlight of the day for parents is the chance to talk with current parents about the value of McCallie for their families. You and your son will have the chance to learn more about McCallie from our administration, our faculty and most importantly, our students. If you're interested, you can also take advantage of our overnight visit program, where boys are paired with a current student, spend the night in the dormitory and get a feel for campus life at McCallie. If you'd like to know more, let us know on the form, and we'll help set things up. To RSVP for a Visitors Day, please complete the form on this page, and we'll be in touch with all the details. To schedule an individual visit (available most school days), contact us: admission@mccallie.org or 423-493-5848. NOTE: There are a limited number of places for overnight visits for each Visitors Day. Once those places have been filled, we will begin a waitlist. The January 11th Visitors Day has a waiting list for overnights.